This is an amazing work of international, classic and delicious food and it happens to be vegetarian. 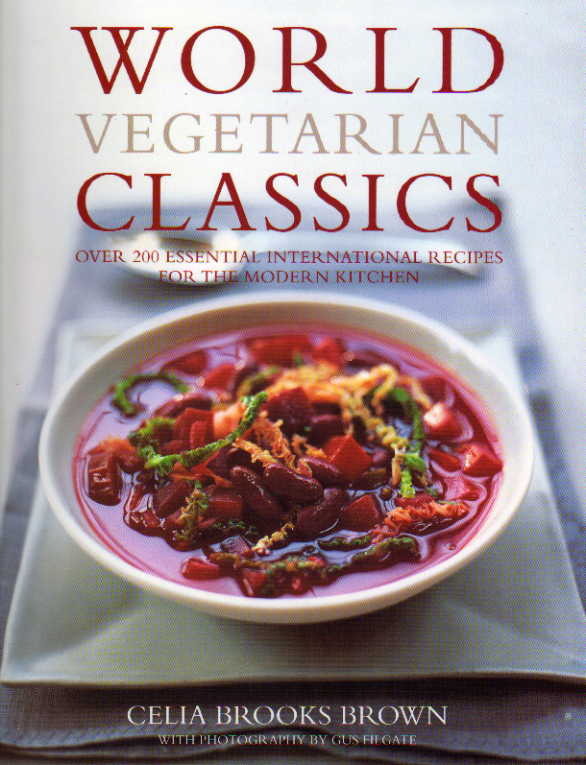 There are 200 recipes in World Vegetarian Classics which have been tailored to the needs of the western home cook. It’s more than just a cookbook though. This is an archive of some of the best vegetarian food the world has to offer. The author, Celia Brooks Brown, is a favourite face on food TV in Britain. She has an infectious enthusiasm for her subject and has done much to dispel the myth that vegetarian food is necessarily bland, beige and boring. Celia is an attractive American who has made her home in London and takes full advantage of the array of ethnic and fresh foods on offer. She also has a regular column in The Times which allows her to share her adventures of working an allotment. This large-format volume has photography by Gus Filgate who must be one of the most respected food photographers around. The book is further enhanced by the contributions of some of the foremost authorities on specific cuisines. This reads like a Who’s Who of the wise and worthy of the food world. Marlena Spieler has over 50 cookbooks to her credit and many of them award winners. She kicks off the North American and Canada chapter with her view on regional food history and some charming memories. Sri Owen is the expert for Southeast Asian cuisine and she is probably the undisputed expert on the subject. Each region has its own culinary giant to add weight to this already notable cookbook. Celia has chosen recipes that are authentically vegetarian. That is to say that they are not meatless versions of non-vegetarian dishes (a bacon sandwich without the bacon somehow just doesn’t work). These are recipes that started as vegetarian and have remained that way. Every region has its traditional specialities that might now be either internationally celebrated, like for instance Spanakopita (Greek spinach pie with feta cheese), or might remain culinary secrets such as Arshda Madnov (macaroni baked in yogurt with feta cheese and vegetables) from Armenia. World Vegetarian Classics has many lovely dishes but my favourites would include Kai Look Koie (Son-in-Law Eggs) from Thailand which is so simple but stunning nonetheless, Khagina (Egg Torte) from Afghanistan which is a fresh take on Spanish Omelette, and Akara with Pilipili (Bean Cakes with Chilli Sauce) from Nigeria. I am not a vegetarian although I choose to eat very little meat and almost no red meat. On the other hand, I do eat and enjoy all vegetables apart from Brussels sprouts (which I hope never to invite across my threshold). I find World Vegetarian Classics to have great appeal even for carnivores. You won’t be eating these dishes because they are good for you (although they are) but because they are always inspiring, often exotic, and all are thoroughly delicious.